Late fall can present challenges when it comes to fertilizer application. If you don’t apply fertilizer at the right time in the fall, you risk loss of nutrients via runoff. As soil temperatures move toward freezing, the chance of nutrients getting held in the soil decreases and the risk for nutrient loss goes up. Here are some best practices for late fall fertilizer management to keep in mind. 1. Never apply to frozen or snow-covered ground. Do not apply fertilizer if the forecast is for a hard freeze within a week of application, and never apply fertilizer to frozen ground or snow-covered ground. To ensure nutrients in the fertilizer stay held where applied, they need time to react with the soil. Phosphorus, for example, needs seven to ten days after application without a rain event to react. If the ground is frozen, those nutrients won’t hold in the soil. 2. Use tillage to prevent runoff. If you’re considering applying fertilizer in the fall to soybean stubble, you should also till the soil. 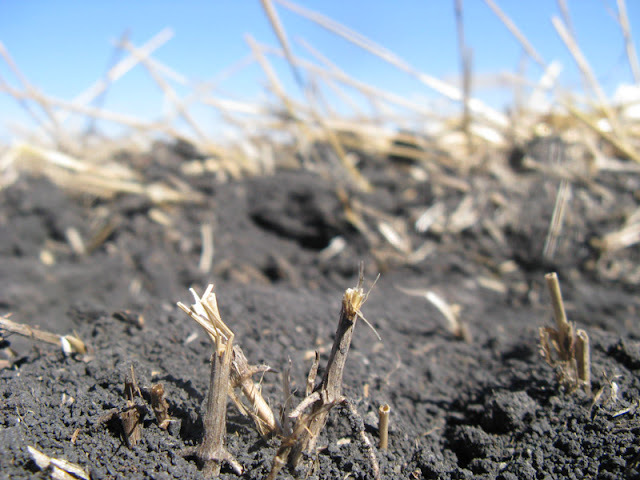 Without tillage, you run a significant risk for nutrient loss from fertilizer in the case of a runoff event. Tillage is a best management practice to prevent runoff, as long as the tillage does not increase the risk for erosion. If the tillage results in less overland movement of water, you’ll reduce the risk for nutrient loss. However, any time nutrients are left on the surface, there is a risk for loss. 3. Properly seal anhydrous bands to reduce risk of nitrogen loss. For anhydrous ammonia applications, be sure the ground is sealed behind the knives. Cold weather will not prevent loss, and since anhydrous is a gas, it needs to be properly sealed. 4. Incorporate fall urea applications. Urea needs to convert to ammonium in order to be held by the soil. There is significant risk that N will not have enough time to make that conversion in frozen soils. Fall urea applications are acceptable in areas of Western Minnesota, but be sure to incorporate. This ensures the urea N gets converted to ammonium N, a form that is held by the soil. Ammonia volatilization can happen, even in cooler soils if it isn’t incorporated. 5. Remember the risk for spring loss. All fertilizers are soluble in water and will move with water during runoff events. If applied to frozen ground, there will be little reaction with the soil and a greater potential for loss whenever water moves across the soil. If fall fertilizer conditions don’t favor fertilizer application, it’s better to wait until spring than risk nutrient loss.